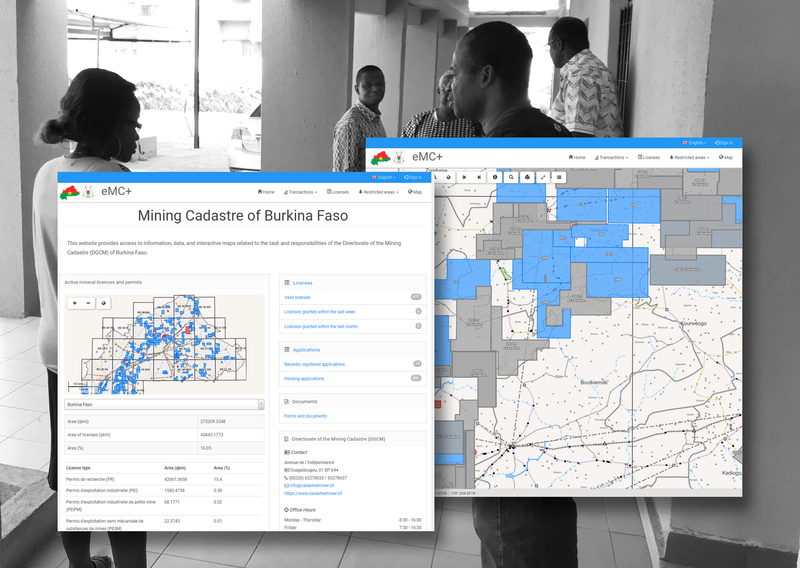 Based on its 20 years of experience in designing and implementing mineral cadastre systems for jurisdictions across the globe, GAF has now successfully completed the implementation of a modern computerised mining cadastre in the Republic of Burkina Faso. In practical terms, the project involved implementing a rule-based, computerised management system with GIS functionality that caters for the entire life cycle of mineral titles. Following a thorough analysis of the administrative prerequisites, the mineral law and the regulatory framework, as well as modernisation and streamlining of the existing paper cadastre system, the GAF team and the DGCM established an up-to-date and consistent database of the mineral rights and introduced a harmonised administrative, procedural and technical framework and cadastral procedures that are compliant with the law. Based on this, GAF configured and installed a customized cadastre management system component of eMC+. The establishment of the new system further increases DGCM’s capabilities for the transparent and efficient management of the licensing process. The entire implementation was accompanied by comprehensive institutional and technical capacity building activities within the cadastral organisation. With the conclusion of the system implementation, Burkina Faso is now well on its way to making its mining sector more attractive for international investors and gain more benefits of its impressive mineral resources by transforming the potential raw material wealth into a continuous and constant source of income for the government and society. eMC+ is GAF’s framework for providing mining cadastre authorities worldwide with a complete package of products and services. Using the eMC+ framework as a basis, GAF can create tailor-made and maintenance-friendly solutions for each individual client. As it is web-based, it works in an intranet setting as well as over the internet. The application's source code can also be made available to the client, thereby ensuring that the solution can be used sustainably beyond the lifetime of the implementation project. The system is based on FOSS (free and open-source software), which ensures that no additional costs are incurred for 3rd party licences and their maintenance. The total cost of ownership is therefore fully transparent and there is no vendor lock-in. eMC+ increases institutional capacity and efficiency by providing a comprehensive mineral tenure management framework.